Like many babies, these tiny offspring arrived this spring amid much fanfare and a little trepidation. 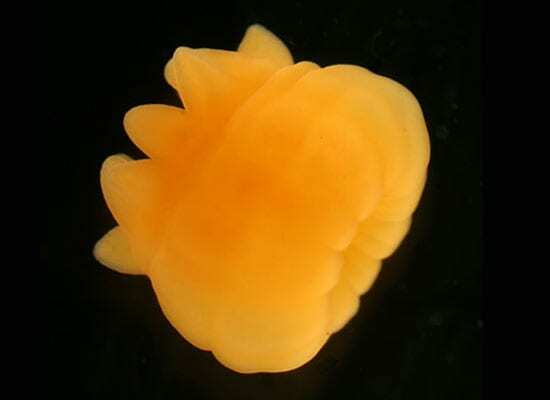 Never before had scientists witnessed the birth of deep-sea Antarctic corals, which unlike like their tropical, shallower-water cousins, normally live and breed in the icy, sunless depths, 165 to 6,650 feet (50 to 2,000 meters) below the surface. Their parents had been collected in nets and placed in saltwater tanks onboard the polar research vessel Laurence M. Gould. 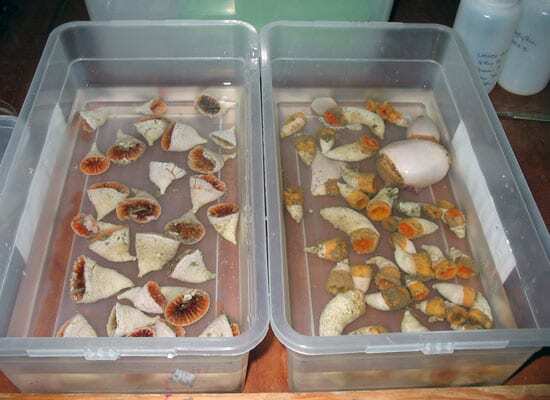 Day and night, in the ship’s laboratory, Woods Hole Oceanographic Institution biologist Rhian Waller watched with delight as dozens of the bright orange coral larvae crawled from the mouths of adult corals. Almost immediately, the small blobs, no bigger than peppercorns, began settling on glass tiles and black rocks. In May and June, Waller traveled for the first time to the remote Southern Ocean surrounding Antarctica to see if she could learn how tiny, shapeless larvae turn into large, colorful corals. 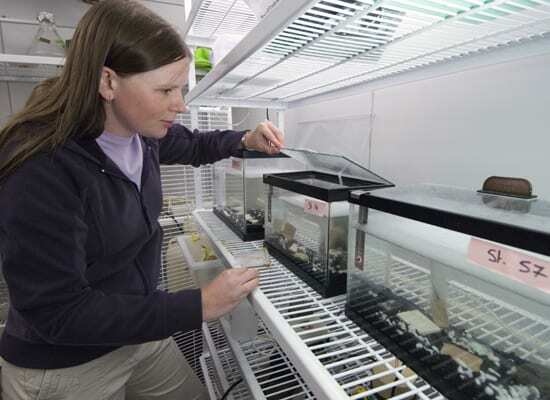 Two months later, she has continued to keep a handful alive in a basement lab at WHOI. If they survive, and eventually form skeletons, Waller will be among the first to document their development from larvae to adult coral. Most people know the tropical varieties of coral living in warm, relatively shallow, sun-dappled waters, from the Florida Keys to the Caribbean islands to Australia’s Great Barrier Reef. They host algae that convert sunlight into sugar and nutrients that provide the corals with food. However, deep-water corals—the type Waller studies—live in dark seas up to three miles (5,000 meters) deep. These survive in the sunless depths by ingesting plankton and other protein-packed particles raining down from the surface. More than 1,000 species make their homes off the coasts of northern Europe, the northeast United States, and along mid-ocean ridges. Corals found around Antarctica live in water so cold—rarely rising above 33°F (1°C)—that ice coats the surface for at least part of the year. These waters, famous for penguins and icebergs, don’t seem a likely home for colorful, delicate-looking corals. Waller focused on two cone-shaped corals, a sherbet-orange variety called Flabellum thouarsii, and a pale yellow coral called Flabellum impensum. Both reproduce in an unusual way: They brood their fertilized larvae in the adult females’ mouths, then release them fully formed into the water to settle and grow. Marine biologists knew some details about these corals’ taxonomy, but “practically nothing” about how they brood, Waller said. Flabellum impensum, identified and named in 1848 by French naturalist Henri Milne-Edwards, is known to live only around Antarctica. 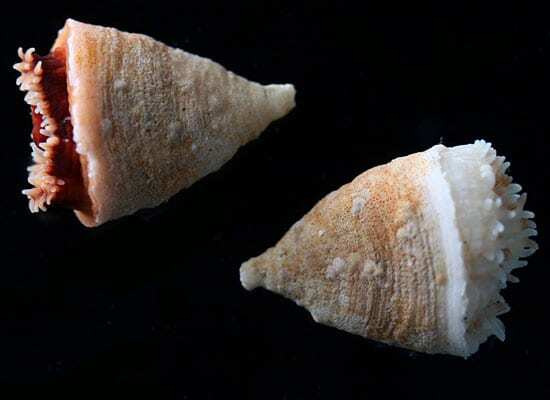 Flabellum thouarsii,identified andnamed by biologist Donald F. Squires during a 1962 expedition, covers a slightly larger territory, from Antarctica to Argentina. 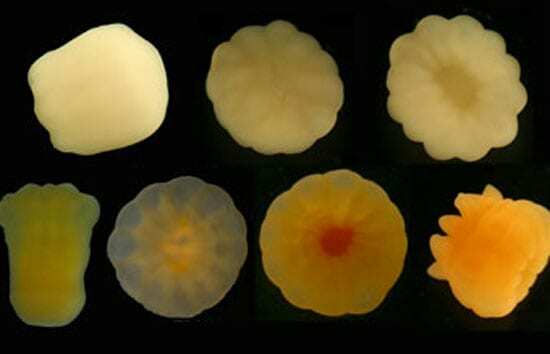 Neither of these scientists studied the corals reproduction and development in detail. Waller was curious to know more—and was concerned about the fate of coral habitats worldwide, many under threat from fishing pressure and pollution. 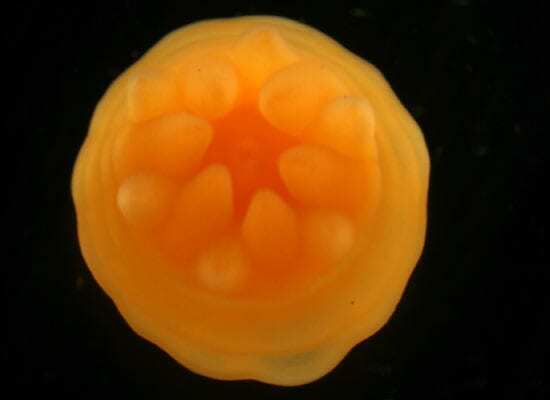 She began researching their reproduction during her doctoral research at Southampton University in England. 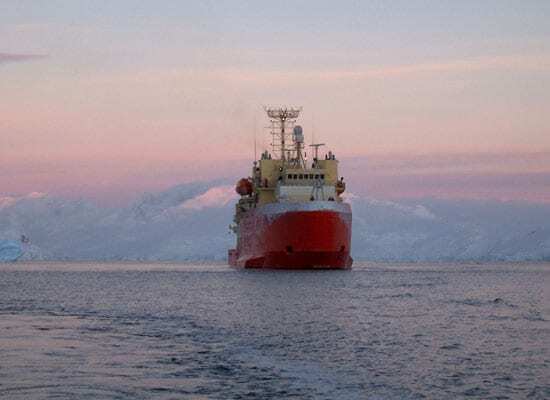 Inquiries led her to biologist Craig Smith at the University of Hawaii, who gave her preserved samples of brooded larvae that he had pulled from the Antarctic seafloor in a trawl. “I had preserved larvae, but nothing that showed me how they grew from larvae to adult coral,” she said. Since then, Waller has been eager to take the work a step further by growing them in a monitored laboratory environment. While some think corals are plants or rocks, they are actually tiny animal polyps that reproduce in several ways, depending on the species. Some spawn by releasing millions of eggs and sperm into the water column. 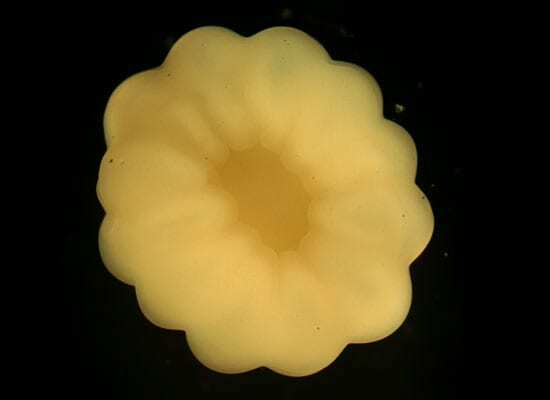 When fertilized, they settle on seafloor surfaces to form colonies. Other corals reproduce asexually by budding, with new branches growing out from an existing coral. Many reefs are created this way, built up from the skeletons of generations of coral. 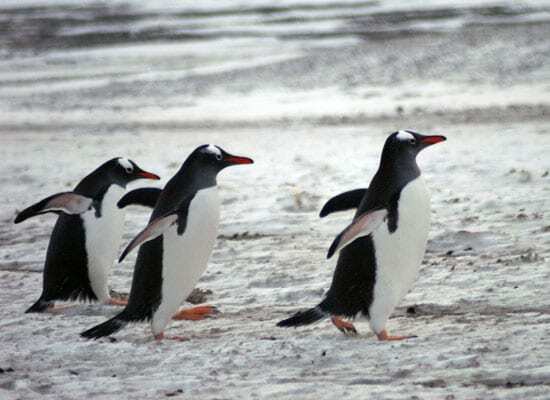 The species Waller studied during four weeks of research north of the Antarctic continent brood their young within the soft tissue walls of their mouths. Scientists believe that male corals release sperm into the water, which are taken into the mouths of the females. There, the eggs are fertilized and form larvae. Exactly how long the larvae brood inside the females’ mouths, and when the offspring begin building their skeletons, remains a mystery. 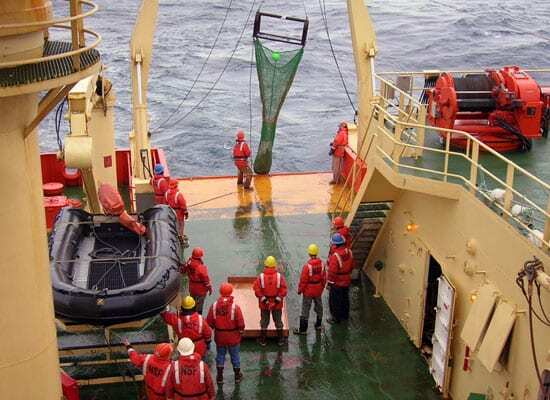 Scientists aboard the Gouldcollected the adult corals using a trawl dragged over the seafloor. Waller said she and others new to Antarctica reacted with surprise to find the seafloor was so rich with life. “I guess I thought it would be more barren,” she said. “I’ve studied deep-water corals elsewhere in the world and was blown away by the richness and diversity here.” Just 10 minutes of trawling resulted in a net bulging with fish, corals, worms, brittle stars, and sea cucumbers. Scientists carefully picked through the animals brought aboard the vessel, separating them into different tanks. Different biologists on the vessels focused on different organisms. It didn’t take long for Waller to watch the coral larvae emerge; some arrived within an hour of being on the ship. “They just crawled right out,” using stubby, hair-like cilia, she said. Development was almost immediate. Within 24 hours Waller could see the mouths and tentacles form. At 48 hours they had settled on the bottom of the tank, and a day later began feeding on copepods. “It was like watching an infant grow into a toddler within a few days,” she said. Then, disaster struck. Before she could monitor their next stage of development—the creation of their skeletons—a storm blew 50-knot winds that tossed the ship. Waller recalls peering fretfully into the tanks and watching many larvae perish. “The babies bloated up and floated around from the stress,” Waller said. A few survived. Not long after the storm, and a few more larvae collections later, the ship headed back across the Drake Passage to Punta Arenas, Chile. No one had ever set a precedent for keeping deep-sea coral larvae alive, and Waller had not expected or planned to bring any of larvae home, so her packing was careful yet rudimentary. 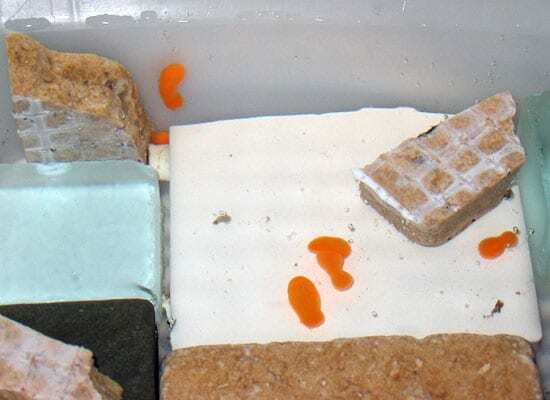 The 32-hour trip back to Cape Cod is an exhausting journey for humans, but fraught with peril for immature corals packed in a portable lunch cooler and jammed under airplane seats. With the help of fellow scientists, ice was replaced during three layovers. The corals’ plastic home was opened repeatedly to curious airport security personnel in South America and the United States. “One guard even dipped his finger into them, to taste the saltwater—I guess to make sure it wasn’t anything harmful,” she said. By the time she reached Boston, where a friend met Waller with fresh bags of ice, around a dozen larvae remained alive. By bringing them back to WHOI, Waller hoped to continue tracking their development. Think human babies require patience and dedication? Day after day, the coral larvae have remained—motionless—in a refrigerated room set to 33°F (1°C), perhaps lulled by their tanks’ bubblers and the purr of the freezer fan. Waller changes their saltwater weekly and feeds them copepods she also brought from Antarctica. She and the “babies” continue to get support. Ellen Bailey, of the Ocean Life Institute at WHOI, assisted Waller on board the Gould and still checks in. “Did you know I’m a godmother?” Bailey joked. Waller checks on the larvae daily, hoping to see developments. So far, there have been none. “They may be in some sort of hibernation mode, from the stress of moving here,” Waller said, squinting at the tiny larvae. All seven could fit on her thumb. She admits to worrying about their demise. After all, when they die, it’s not like she can easily get to Antarctica and collect more. The opportunity for a journey—expensive, long, and often grueling—comes around only occasionally. Waller said that even if they don’t make it, she has learned valuable lessons. “We never would have known that they can blow themselves up like anemones when stressed; how long they take to settle on the bottom; the fact that they crawl, that they can morph into different shapes rapidly, that they feel out where they want to settle, that they feed within a few days, that they really do not have the capability to go very far,” she said. 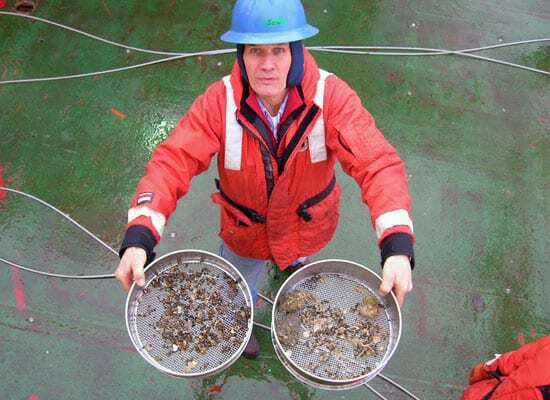 Funding for this research came from a National Science Foundation grant to Rudi Scheltema at Woods Hole Oceanographic Institution and Ken Halanych at Auburn University. Rhian Waller would like to thank Susie Balser and Will Jaeckle for their assistance with the coral larvae during and after the expedition. She was supported on the expedition by a United States Geological Survey-Woods Hole Oceanographic Institution Postdoctoral Fellowship. Includes a daily journal and photos from the spring 2006 expedition.